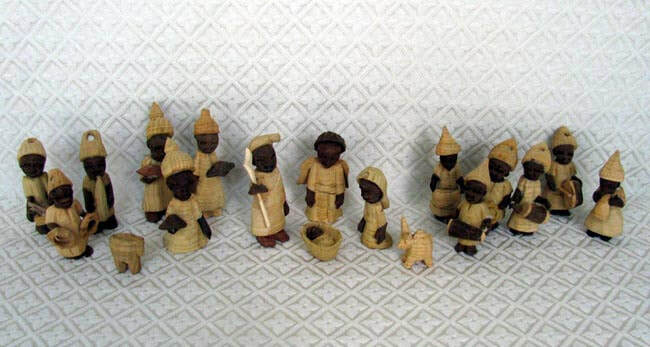 This unique 18-piece Nativity set is hand-carved in Nigeria in the tradition of thornwood handicrafts that have been produced in this area for centuries. The set contains nine traditional Nativity figures: the Holy Family, an angel, a sheep, a small ox, and three wise men with gifts. Joseph measures 3.25 inches tall. This set also includes nine villagers each playing a drum or other instrument, because the birth of Jesus definitely warranted a nine-piece band! Please note that the musicians have holes drilled in their hats.